With 64% of the residential water being used outdoors, Utahns can conserve millions of gallons annually if they water more efficiently. One of these ways is to use a smart controller that allows homeowners a more efficient way to irrigate, using only what the plants actually need. The Utah Division of Water Resources (DWRe) provides a statewide network of weather stations for Utahns to use. Weather stations track evapotranspiration (ET) and tell Utahns in a given region how many times they should water during the week. If you don’t yet have a smart controller installed, visit the Lawn Watering Guide online at www.conservewater.utah.gov to see how many times you should water each week. ET is defined as the amount of water a plant and its environment lose from evaporation and transpiration. Simply put, transpiration is water the plant uses to grow and survive, and evaporation is water lost from the surrounding soil. The factors that affect ET are temperature, wind, precipitation, humidity, and solar radiation. ET is usually expressed in inches of water over a certain time period; commonly, a day, week, month, or year. DWRe’s main emphasis in water conservation education is for residents to water to the ET requirements of their landscapes as efficiently as possible. Smart controllers can assist residents in accomplishing this. Smart controllers can reduce outdoor water consumption by an average of 15% to 30%. Some smart controllers use weather data and local sensors to manage the property’s sprinklers. These types of controllers receive data from either sensors and/or weather stations and then turn the sprinklers on or off based on these weather conditions. These controllers can also turn the sprinklers off in the event of rain, high winds, or low temperatures. Other smart controllers use soil moisture probes that measure how much water is in the soil. As you water your landscape, imagine that there is a reservoir of water under the ground and you are filling it up. The soil moisture probe will measure how full that reservoir is. Once the reservoir level drops below a certain level, the probe will turn the sprinklers on and re-fill the soil storage reservoir. These types of smart controllers can also turn off sprinklers during rain events. 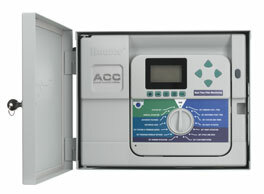 Once a smart controller is properly installed, the controller will automatically regulate your sprinkler system. This means that you will no longer have to adjust your sprinkler times and duration for seasonal changes and will still have a healthy, beautiful lawn! Watering plants with the correct amount of water that is required by the plant is the healthiest way to grow plants. Plants only require a certain amount of water to maintain health. Too much water can actually damage your grass. Overwatering promotes fungal growth and insect activity. A smart controller can eliminate over-watering. Smart controllers can cost anywhere from $100 to several thousand dollars, seeming to be an expensive investment. However, when you consider what you are saving in both monthly water charges and water, a smart controller can have a fairly fast payback time.